Today was such a beautiful day (a brief break in the Bay Area from the recent rain) that I decided to take a walk to the Elmwood neighborhood in Berkeley. It's been awhile since I've been here, so it was nice to check out some of the new things in the area, including the 3-month-old Summer Kitchen Bake Shop. Opened by husband-and-wife team Paul Arenstam and Charlene Reis, Summer Kitchen was inspired by their trips to Martha's Vineyard. The little place on College Avenue has the pristine beach cottage feel of Martha's Vineyard, but also has a bit of country living like Napa Valley. Its bright interiors can bring a summer feel even on a winter day. Selling sandwiches and picnic-like food and a whole bunch of baked goods, this looks like a little stop on your way to someplace special, that last stop to pick up some amazing food before your final destination. 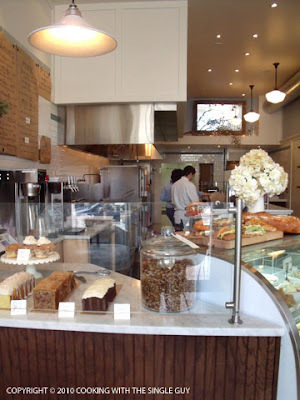 But Summer Kitchen is in the dense Elmwood area, just a door away from the popular Ici ice cream shop and other little stores. 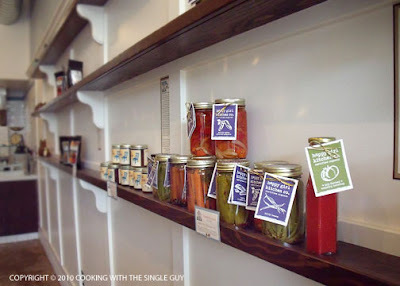 Along the walls, there's a country market feel with products that are high-end gourmet items that are all locally made. Things like these Happy Girl pickled items, Blue Bottle Coffee, and Blue Chair jams. 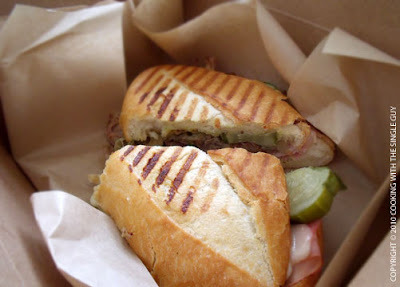 I decided to stay for lunch, ordering the pressed Cubano-braised pork sandwich with rosemary ham, Patch's housemade pickles, Swiss cheese and spicy mayo ($8.50). I love pressed sandwiches, and since this was made to order, it was nice and toasty. The meat was tender and easily pulled away with each bite, and I enjoyed the mix of savory meat with the cheese and especially the perfect pickles, bringing crunch and a slight sweet-tart taste. The quality of the sandwich reminds me of Blue Barn, one of my favorite sandwich stores in the Marina in San Francisco. I really want to go back and try some of the cupcakes at Summer Kitchen, because it had some interesting flavors, including one that looked like a meringue. Instead, I went next door to Ici for some cardomom-darjeeling ice cream. I think that's one of the advantages of having lunch at Summer Kitchen -- its close proximity to Ici for dessert! Summer Kitchen Bake Shop is open for lunch and dinner, but since it has very limited seating (one big table, a tiny table, and a few counter seats) this seems more like a place to pick up some amazing food to take home (or when summer arrives ... for a picnic). Whether its inspiration was Martha's Vineyard or Napa Valley, Summer Kitchen brings a fresh image of high-end country feel to Berkeley. 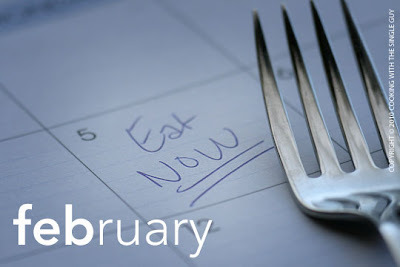 Gregoire: "Bringing Restaurant Entrees to Your Dinner Table"
Feb. 5-14: San Francisco Beer Week. Well, little more than a week. But this annual celebration of beer all over town kicks off with an opening gala at the Yerba Buena Center. (Admission: $45) But it’s not just big galas — also on tap are special dinners at select city restaurants, a beer-themed scavenger hunt, and even beer-flavored ice cream at my favorite Humphry Slocombe. For a complete list of events, visit the SF Brewers Guild’s Web site. Feb. 6-7 (Saturday-Sunday): Chinese New Year Flower Fair in San Francisco. This isn’t exactly a food event, but when you have a street fair you know there’s going to be some kind of food! This annual event in Chinatown is primarily for people to stock up on blooming flowers to decorate their homes ahead of the Chinese New Year. (It’s good luck to have blooming red flowers for the new year.) But stroll along the booths and beyond the bank giveaways and mobile phone pitches, you might see food like mochi cake and peanuts perfect for the new year! Portions of Grant Avenue and Pacific Avenue closed from 10 a.m. to 8 p.m. Saturday and 9 a.m. to 6 p.m. Sunday. For more information, visit the event Web site. 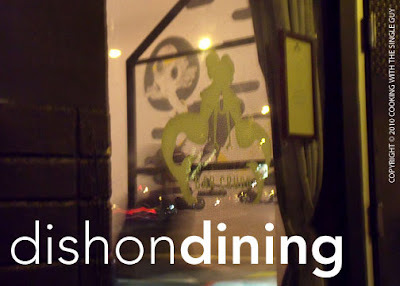 Feb. 11 (Thursday): Dark Dining by TasteTV. OK, I don’t get this whole eating-in-the-dark trend because I like to see my food! But if you’re all into being in the dark, especially for a Valentines theme dinner, then head over to Supperclub (the San Francisco restaurant where you eat on a bed … eating in bed in the dark, oh my!). This special event has limited space and there are only a few tickets left. Cost is $95, which includes wine pairing. Click here for more information. Feb. 11 (Thursday): Singles and Sprinkles at 18 Reasons. This Mission neighborhood community food group is planning a night for singles, with a bit of cookie decorating and sweets for this Valentines affair. Suggested donation of $10 for 18 Reasons members and $15 general admission. 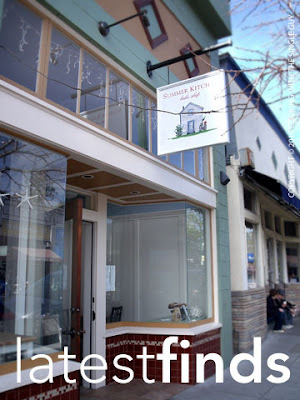 Event runs from 7 to 9 p.m. as a drop-in social at the 18th Reasons location at 593 Guerrero St.(at 18th). For more information go to www.18reasons.org. 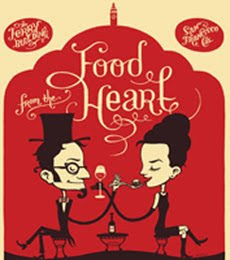 Feb. 12 (Friday): Food From the Heart. This annual Valentines-themed event at the San Francisco Ferry Plaza always adds a romantic touch as you stroll through the cavernous Ferry Building at night munching on tasty bites. This year you can also try a variety of wines from Napa Valley (got to support the California winemakers, who saw a dip in sales in 2009). Event runs from 5 to 8 p.m. and you can purchase food tickets at tables around the Ferry Building. Stores and restaurants will be offering up nibbles for $2 to $4 each. Proceeds benefit Slow Food San Francisco. Click here for more information. Feb 13 (Saturday): Wagashi Workshop. The Japanese Cultural and Community Center of Northern California has some interesting events and classes. If you’re a fan of mochi, the sticky rice flour candy, then you might want to check out this class to learn how to make uguisumochi and hichigiri. (And if you know what kind of mochi this is, then you definitely need to take this class.) Class runs from 1 to 3:30 p.m. and includes demonstration and hands-on practice and takes place at the center at 1840 Sutter St. in San Francisco. Cost is $25 for members and $30 for non-members. For more information, go to the center’s Web site. To sign up call 415.567.5505 or email programsevents@jcccnc.org. 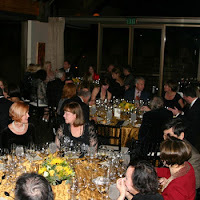 Feb. 19 (Friday): Napa Valley Mustard Festival Grand Dinner. 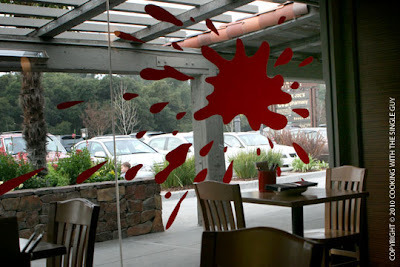 The culinary highlight of the splendid Mustard Festival will be hosted by popular Brix restaurant in Yountville. Head Chef Anne Gingrass takes the lead with other Napa Valley guest chefs helping out to create a seven-course dinner with wine pairing. Event starts at 6 p.m. and comes with a $225 price tag for each ticket. Visit the Mustard Festival Web site for more information and to buy tickets. Other major Mustard Festival events will take place throughout the month and into March, including the Marketplace (March 13-14) where you can taste a variety of food products at various sites along the riverfront in downtown Napa. 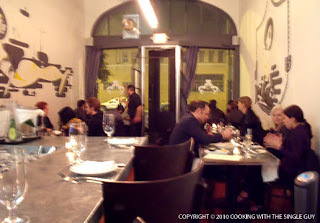 Feb. 24 (Wednesday): Mardi Gras Dinner at Orson’s. OK, I think they’re a bit late considering Ash Wednesday is a week before this date, but when people want to drink and flash beads, who cares, right? So Orson’s in San Francisco’s SOMA district is putting on a special Mardi Gras dinner, which is similar to their monthly cocktail-pairing dinners but with a Mardi Gras theme. Go to the restaurant’s Web site for more information about the menu and to make a reservation. Open daily 5 to 11 p.m. (till 10 p.m. Sundays); weekday happy hour, 5 to 6:30 p.m. Sometimes when I wait too long to try a place, I end up having to chase it down. Luckily in the case of Bar Crudo, it was worth the extra miles. Bar Crudo garnered a lot of attention when it opened up in a tiny spot north of Union Square, serving up crudo — the Italian preparation of raw foods. It was on my list of places to try, but then last year it closed up and moved to somewhat larger digs in the Divisadero corridor that’s between the Western Addition and the Panhandle neighborhoods (which the restaurant NOPA just a block away is trying to redefine as “north of the Panhandle”). Damn the inconvenience. I jumped on the bus one weeknight and headed to the center of San Francisco, partly because I was already heading in that direction for a doctor’s appointment and also because I was craving some raw fish after weeks of heavy eating from the holidays. 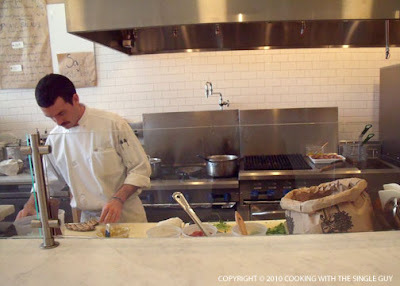 When I arrived at Bar Crudo, I easily found a seat at the counter facing the bar and the open kitchen. 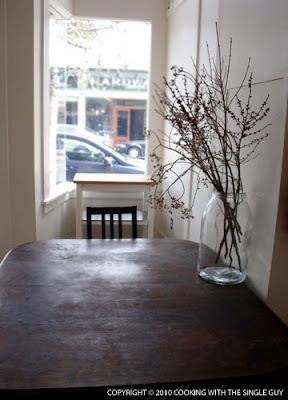 The space has several small tables on two sides in the front and a few more tables in an alcove in the back. I felt the best seats were at the counter — not only because you get a front-row seat of the prep work but the bartender was especially nice and helpful. The dinner menu is filled with a variety of raw fish preparations along with a raw bar with oysters. But there’s also a few cooked items served hot or cold, and you can order seasonal shellfish like a whole or half Dungeness crab (served simply with butter). To get a nice taste of everything, I ordered the Crudo Sampler ($12), which includes four different bites from the raw menu. I tried the Tombo Tuna (bottom right), which was my favorite of the four. Who doesn’t love tuna, right? (Damn the guilt!) The fresh, oily tuna was dressed with pear chunks, hazelnut bits and a grape reduction that provided a nice savory flavor to the tuna. I would get a whole order of this next time. Then I tried the Butterfish with Orange Vinaigrette (bottom left) that was served with a tiny bit of black garlic and shiso. This was the extreme of the tuna. Where the tuna was fresh and bright, the butterfish fell flat and the flavors were muted. 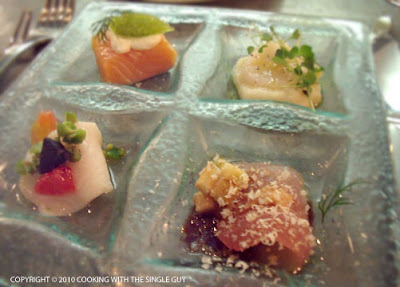 The Artic Char (top left), which resembles salmon, was a beefy chunk of fish served with a complementary horseradish cream with wasabi, tobiko and dill. I liked the texture of the tobiko and the horseradish wasn’t very strong but balanced. It was lovely. Finally, I finished off with the Hokkaido Scallop (top right), which sat on a celery root and roasted apple puree with a pinch of truffle salt. The puree seemed a bit on the bland side, and I didn’t get any sweetness from the scallop. This was just OK.
From the cold menu I ordered the Lobster Beet Salad ($17), which came out looking like a giant dragon roll. The pieces of lobster rested on roasted gold and chiogga beets and then covered with a lot of mache greens. Underneath the greens was burrata cheese stretched over the beets. Everything was brought together by the banyuls vinaigrette. 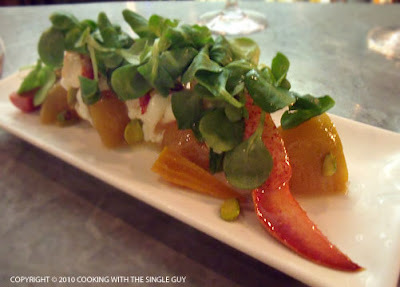 While this dish looked impressive and I loved the beets, I felt none of the ingredients worked together. The burrata seemed chewy against the lobster meat, and the greens didn’t seem to accentuate the beets. Everything seemed a bit disjointed. My last course for the evening was something warm — a cup of the Seafood Chowder ($7 but I only paid $5 because it was still happy hour/$14 for a bowl). 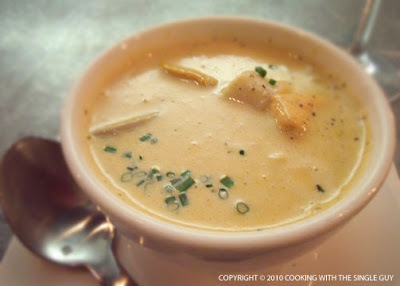 The slightly orange-tinted chowder looked pretty big for a cup, and it was packed full of fresh seafood such as fish, mussels, shrimp and squid mixed in with potatoes. The menu also mentioned applewood smoked bacon but I didn’t notice any. Along with being meaty and filling, the chowder had a balanced flavor with just a slight tinge of tartness from what I’m guessing was red vinegar. I love it when they had a twist of vinegar to cut the creaminess of the chowder (reminds me of a great gazpacho I had at Picco Pizzeria). I thoroughly enjoyed my cup. In its reincarnation, Bar Crudo has a definite neighborly feel. The bartender is smart about the wine selection, and everyone else is welcoming and professional. Despite a bit of inconsistency in some of the dishes, overall I found Bar Crudo to be a refreshing spot for times when you don’t want a heavy meal but instead want something light and promising. I’ve talked a bit about my love for any kind of soup noodles — from Vietnamese pho to Japanese ramen or udon. 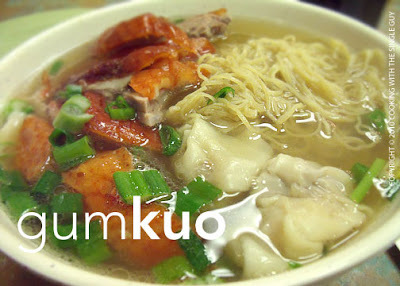 But growing up in a Chinese family in Hawaii, my very first soup noodle was the won ton mein. And not just any kind of won ton mein. Whenever I ordered these thin, springy noodles with the folded dumplings, I always would have them topped with roasted duck. Who wouldn’t? The following is a recap of the places I visited, applying my five-star scale to three categories: noodles (got to be thin and springy), won ton (shaped well and not dense) and roasted duck (lots of flavor and crispy skin). I chose the places to visit by one simple rule: they had to have roasted duck hanging in their window. Lots of restaurants offer won ton noodles, but not all of them serve it with roasted duck. You get this mostly in the dedicated noodle shops or the restaurants with a BBQ counter, with the butcher chopping up roasted ducks, soy sauce chicken or roasted pork. 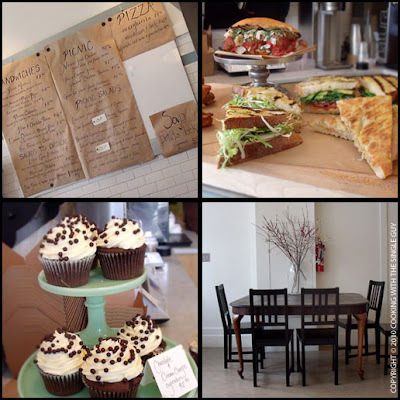 Best Taste Restaurant, 814 Franklin St. (between 8th and 9th Sts. ), PH: 510.444.4983. Cash only. Noodles (3.5 stars): The lightest color of all the places I tried, but still nice and thin. Had an odd texture on the outside, like it wasn’t rinsed thoroughly. Decent taste. Won ton (2 stars): Six dumplings that were huge with a tail likely from excess won ton wrappers. Primarily pork with just a bit of shrimp, sometimes no shrimp. Duck (3 stars): Not the largest amount but decent with a few choice pieces of meat. Coloring somewhere in the middle, not charred but not light. Funny how Chinese restaurants have names that make a lot of claims like “No. 1 noodle shop” or in this case “Best Taste.” I stumbled onto this place walking around, and it has a real local feel. 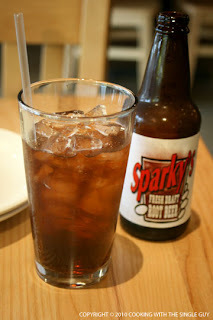 Brightly lit with no-nonsense food, Best Taste had some nice servers who were pleasant. I also liked how they served the won ton noodle soup with a bit of greens (in their case, green cabbage). 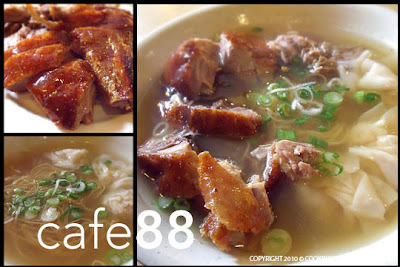 Café 88, 388 9th St. (near Franklin), ground level of the Chinatown mall, PH: 510.844.0651. Cash only. Noodles (4 stars): Thin, but not hairline. Nice yellow color with some pull. Won ton (3.5 stars): Only three dumplings, but thin skin and nice balance between pork and shrimp. The shrimp tasted really fresh, and overall had a nice sweet flavor. Duck (4 stars): Served on the side, it was brought to table separately by the roasting station people. Nice variety of leg and breast meat, and great thin skin with caramel red color. Café 88 is one of the newer noodle shops in Chinatown, with a clean, contemporary décor. It’s right next door to Gum Kuo (see below) so I bet there’s a bit of competition between the two. Both serve top-notch won ton noodles, slightly different in taste and style. But I think you can’t go wrong with either one. Because of its contemporary feel, Café 88 has a lot of young servers — some of whom can be standoffish like they could care less. 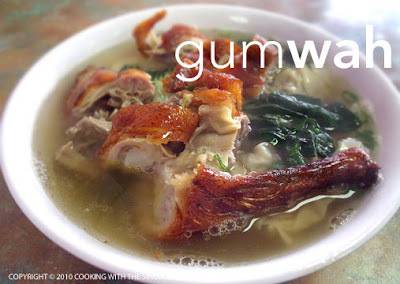 Gum Kuo, 388 9th St. (near Franklin), ground level of the Chinatown mall, PH: 510.268.1288. Cash only. Noodles (4 stars): Thin, firm and nice. Bit on the dark color, though. Won ton (3 stars): Round and filled with whole shrimp and pork. Pork seemed liked dark meat and a bit dense. Duck (3.25 stars): Tasty skin, not much meat, nice anise flavor, one or two pieces were on the salty side. Gum Kuo is probably one of the more well-known, long-running noodle shops, right in the Chinatown pavilion in Oakland. The atmosphere is like what I think a Hong Kong noodle shop would be, with workers speaking Chinese and patrons sometimes sharing tables. While Gum Kuo’s won ton noodle soup had a light broth that was slightly sweet, I do have my suspicions on whether they add MSG to the broth because I felt anxious afterwards. Gum Wah, 345 8th St. (between Harrison and Webster Sts. ), PH: 510.834.3103. Credit cards accepted. Noodles (2.5 stars): Thin but darker in color, like wheat. The bowl was so big that it looked like a small portion of noodles, but it turned out to be enough. Not as springy as I would like. Won ton (1.5 stars): Six dumplings that had meat that was oddly dark with some slight red or orange color. It was almost like mystery meat. One won ton came broken with the shrimp falling out. Duck (4 stars): Shiny crispy skin with a lot of flavor, but only a few choice meat pieces — mostly fat and bones. Still, good flavor. Lots of Chinese restaurants have the word “gum” in it because it means gold, and the Chinese love the idea of getting rich or prosperous. At Gum Wah, across Chinatown from Gum Kuo, the place doesn’t conjure up the thought of shiny gold pieces. Instead, it’s a bit dingy. As for the food, they offered a big bowl of duck, won ton and noodles that I thought was the most beautifully presented of all the places I’ve tried. I think it was the use of bok choy as the greens, giving the whole bowl a marbled, rustic look. The broth also had an interesting taste to it, almost like a pinch of sugar or just really good broken down bone marrow. New Gold Medal, 389 8th St. (between Franklin and Webster Sts. ), PH: 510.465.1940. Credit cards accepted. Noodles (3 stars): Thin but on the dark yellow side, a bit softer than others I’ve tried and not much taste. Won ton (4 stars): Five seur gow-style dumplings that were evenly round and shaped with good taste and large pieces of shrimp. Duck (3.75 stars): Not the most pieces but choice cuts, including leg and some fatty pieces. Nice flavor, but a bit chewy. 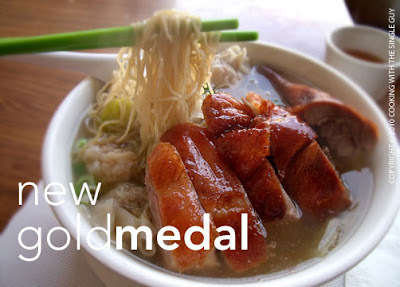 New Gold Medal looks like a large place, with the restaurant divided between the dining area and the roasting counter, where you can buy take out. The broth is really light, almost bland, so it’s good for those who don’t like salty broth or ones with MSG. They included some green cabbage which is always nice. The menu also has a large selection of other items beyond noodles. Yung Kee, 888 Webster St. (at 9th). PH: 510.839.2010. Cash only. Noodles (3 stars): Not as thin as others, but still nice color and cooked with right pull and give. Not soft or hard. Won ton (2.5 stars): Five dumplings that were on the big side because of the dense pork used. Only small shrimp piece can be found. 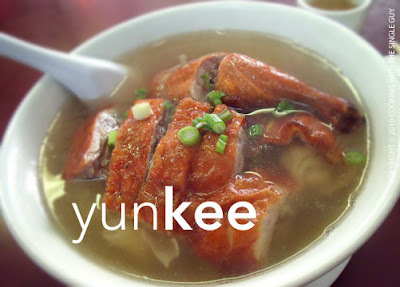 Duck (2.5 stars): Large serving of duck, including thigh portion, but skin not crispy and pale colored and average in taste. The shape of it: Won ton is a really homey dish because mothers make it all the time at home (I’m talking the old generation, not so much now). I even made a video demonstrating how easy it is to fold the square wrappers into a coin-looking dumpling. But sometimes you might see a dumpling that looks like a ball with crinkling skin wrapped around. This is actually known as “seur gow” and is made using a round-shaped wrapper. I don’t really know what’s the difference, other than the shape of the wrapper, but I find most restaurants make the easier “seur gow” shaped dumplings but they still call them won ton. Duck dialects: In Hawaii, the Cantonese speakers in Chinatown called roasted duck “siu gnap,” which literally translates to mean “burn duck.” When I first came to San Francisco, I ordered “siu gnap won ton mein,” and I would get some weird looks. Then they’d say, “foh gnap won ton mein.” “Foh gnap” (I’m using phonetics to spell here) is their common Cantonese dialect to say roasted duck. It literally translates to mean “fire duck,” which I kind of like now because it makes me think it’s fire-roasted duck. Open daily, 11:30 a.m. to 9 p.m. I have to admit I sometimes roll my eyes when I see the word “artisan” slapped on a lot of things these days. 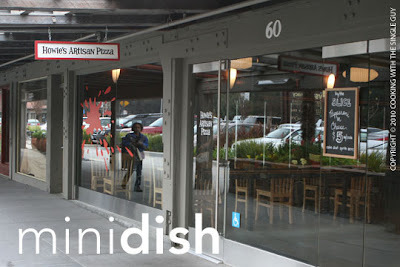 And the latest is artisan pizza, brought to you by Chef Howard Bulka in Palo Alto. And really, what is an artisan pizza? Basically it’s a hand-made pizza where attention is paid to every detail from the fermenting yeast that goes in the dough to the freshness of the broccoli rabe that tops it. Howie’s Artisan Pizza, which opened just two months ago, puts a lot of pride in its pizza and have been attracting the crowds, from college students from nearby Stanford University to the young families along the Peninsula. I was at an event at Stanford a couple of weekends ago, so I was looking for a quick lunch first. Howie’s sells a $5 slice for lunch, but I figured I’ll sit down in the casual dining area just to see what an artisan pizza is like. The menu isn’t just pizza, though. They sell several appetizers, salads, sandwiches and soft serve ice cream with olive oil (it's like the ubiquitous dessert for pizza these days). As I looked over the pizzas, I couldn’t decide and my waitress suggested I split my pizza and get two options. I love it when they suggest that. 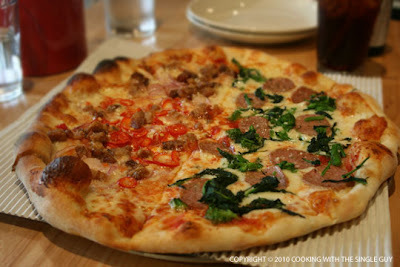 So I ended up with half a Sausage and Broccoli Rabe and half a Pancetta, Red Onion, Red Chili pizza ($15.50). When my pizza arrived, it looked like all the latest trendy wood-oven, thin-crust pizzas I’ve seen in San Francisco. That means the puffy, slightly burnt edges, and of course the thin crust with the bit of salty flavor. Side note: The pizza also arrives on a corrugated cardboard square, which I thought was a nice, natural touch. The pizza was so fresh that it was really difficult to eat it because the mozzarella cheese held everything together like glue. I noticed that as it cooled, it was easier to rip apart. I took a bite first out of the Sausage and Broccoli Rabe, which was topped with house-made fennel sausages and bright green broccoli rabe. I wasn’t a fan of the sausage slices, which had a texture that seemed really processed. (I like my sausage with real meaty chunks.) All the ingredients made the center of the pizza a bit soft, but at least it wasn’t chewy or droopy like the pizza I had at a pizzeria in the North Bay. While I don’t usually like red onions, my waitress convinced me to get the pancetta pizza with red onions because it was her favorite and she guaranteed that the onion would be thinly sliced. And she was so right. 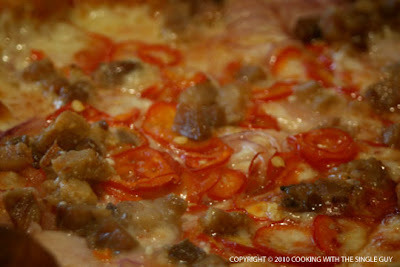 The onions were thinly sliced and it just melted into the pancetta and the red chili. The red chili was actually a nice touch (although there was a section that I wished it was more evenly spread around and not in one giant clump that was burning when you ate it). It really awakens your tastebuds to all the other flavors. 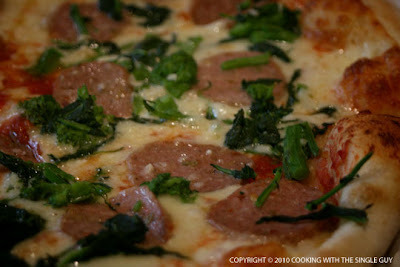 In the end, I was impressed by the freshness of the ingredients but felt the thin crust could be crisper. This is just a mini review since I only had room in my stomach to eat a pizza, and didn’t get to try other things on the menu. Howie’s Artisan Pizza looks like a fun place to hangout, and the pizza is decent for the area but I feel I’ve had better pizzas closer to home. So Howie’s is a reliable drop-in place for pizza if you’re in the neighborhood. 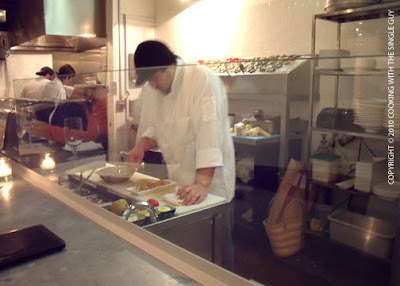 Everyone must want to start off the new year on a healthy note because the first Test Kitchen for 2010 is fish. More specifically, 38 percent of you wanted me to try out Food and Wine’s swordfish penne recipe from its January edition (barely beating out braised pork belly at 35%). That’s fine by me since I’m always looking for different fish to try other than my weekly salmon. I also like the idea of a spicy red sauce to go with it. As always, you can go to the Food and Wine Web site for the complete recipe. But below you can see how it all came together in my kitchen when I recently made this for dinner. The first challenge was finding swordfish. It’s not the kind of fish I typically see at my local Safeway. You’ll probably find swordfish at the gourmet grocers (I spotted it at my neighborhood Piedmont Grocery), but I ended up getting it at the Grand Lake farmers market on Saturday. 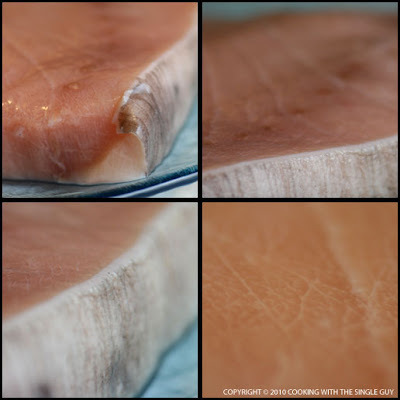 The swordfish was fresh from Santa Cruz and looked a lot like shark filets. They can be pretty pricey too. I paid $18.99 a pound for my fresh one at the farmers market (the grocery stores were less expensive at around $13.99 a pound). Other ingredients were fairly easy to find: capers packed in salt (I always bought the capers in liquid in the bottle, so never looked for the ones packed in salt but was able to find a bottle), two jalapeno peppers, anchovy filets, can of tomatoes (already in my pantry) and penne rigate pasta. I started off by thinly slicing the jalapeno and the garlic. The recipe called for six cloves of garlic, but that frightened me even though I’d be dining alone. So I used more like four nice-sized cloves. For the jalapeno, I was also worried it’ll be too hot so even though the recipe didn’t say so, I cored out the seeds and used only the shell. 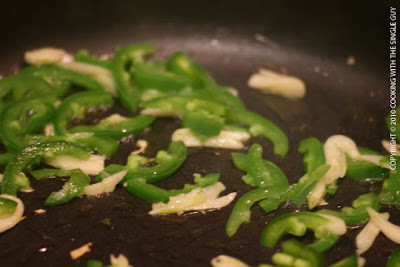 I tossed the two ingredients into my skillet with some olive oil to soften them for two to three minutes. Then I added the anchovies, mashing them up along the way, and poured in the white wine and let it simmer for a bit. 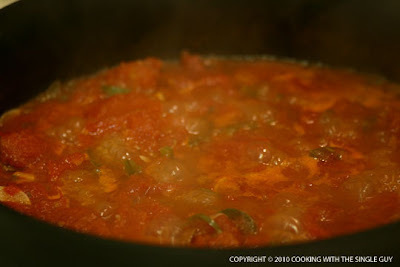 After awhile I added in the can of tomatoes (I’d cut up the tomatoes into chunks first) and let everything simmer. (In the meantime I boiled the pasta per the instruction on the box.) When the tomatoes thickened a bit, I added in my seasoned filet of swordfish that I got at the farmers market and the capers (which I had soaked for 20 minutes and drained). 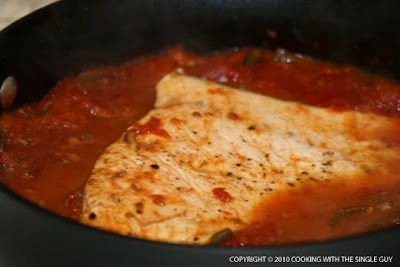 I cooked the swordfish on both sides, letting it sit in the tomato sauce. Then I removed the swordfish after about 8 minutes and set it aside. I let the tomato sauce continue to simmer so it could thicken up some more. 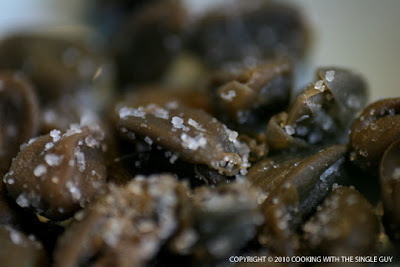 This is also where the recipe tells you to season the sauce, but you might not need to season that much since you get a lot of salt from the anchovies and capers. Finally I added the pasta and let it cook for a minute in the sauce like the recipe said. Then I was pretty much done. 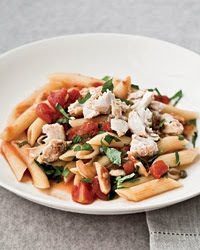 I plated up my pasta and spicy tomato sauce and flaked my cooked swordfish and sprinkled it on top. I julienned some basil (left out the parsley, what’s with these recipes with multiple garnishes?) and finished the dish. Here’s how my dish turned out. Not bad huh? Looks kind of like the Food and Wine picture above, right? 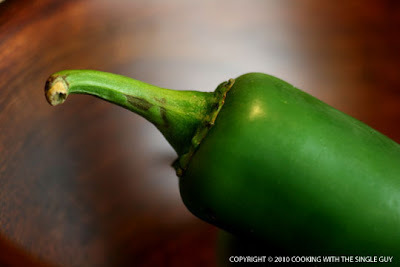 If you like your sauce spicy, you might want to leave the jalapeno seeds in the cooking process. I just got a slight spicy tang when I ate my sauce, but I felt like it could have had more kick. I cooked my pasta till it was done like the packaging said. But I forgot that I had to cook it in the sauce for a minute, so I probably should have just cooked the pasta until it was “almost” done. Then allow it to cook some more in the sauce. My pasta turned out a bit soft. You might not need it, but a wedge of lemon on the side might be nice for the overall dish. I know, another garnish! 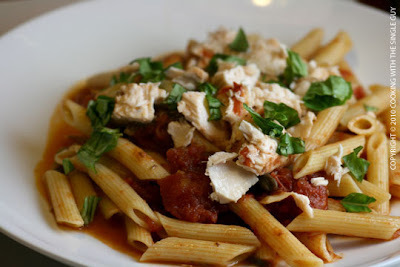 Taste: I loved the meatiness of the swordfish, but I felt the tomato sauce tasted OK but not amazing. It tasted like any other red sauce, lacking much depth or body. Maybe if it was thicker and not as watery? Hard to say. Don’t forget to vote in the poll on the upper right column on what you think I should cook from Food and Wine Magazine’s February edition. 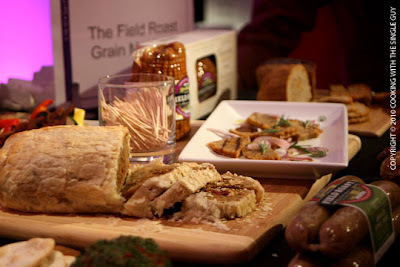 In San Francisco’s SOMA area, tons of people pushing specialty foods and many more playing the role of taste testers have been keeping busy the last few days as part of the 35th Winter Fancy Food Show. It’s one of the largest food shows in San Francisco, but the crowds are a bit too much for me. So instead, last night I dropped by an invitation-only side show called Food Fête, which is a more manageable food show for me. 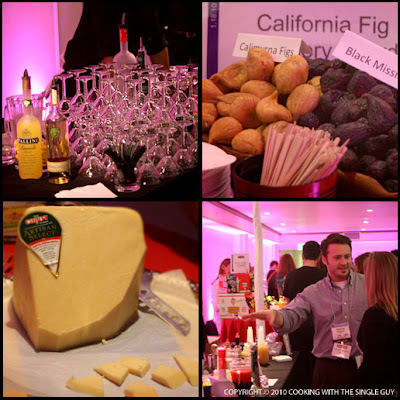 I went around checking out some of the selected specialty food items from producers across the country. Everyone is always trying to come up with the latest food craze – from flavored coconut milk to the next best apple. A few companies tried to offer up new flavors, such as Sub Rosa Spirits. This Oregon micro distillery had a couple of its infused vodka at the bar, including this saffron vodka. I love the idea of saffron, and the color made for a nice bottle. But I have to say the flavor was really subtle. 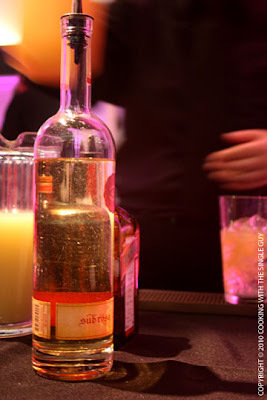 And when you add orange juice to it (like they did at the bar), then really the whole saffron flavor gets overpowered. Still, it’s a mighty strong vodka. Someone that traveled far for the show was Sonny & Joe’s Hummus – coming all the way from Williamsburg, Brooklyn. They offered up some interesting flavors like buffalo (a play on buffalo wings) that had a subtle spiciness to it. I even tried the babaganoush even though I’m not a fan of eggplant, and I liked it. 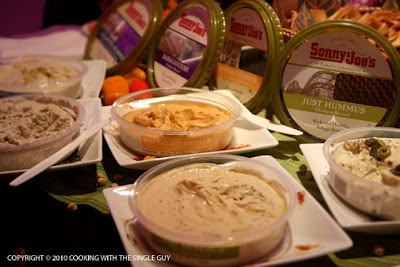 It helps that Sonny & Joe’s hummus have this creamy texture, almost like a mousse. One of the more unusual things I tried was these faux meat from Field Roast Grain Meat Co. Everything made by this Seattle company is vegan, using a wheat grain. They had sausages and meatloaf, and I tried the holiday log that actually tasted a lot like turkey and stuffing combined. 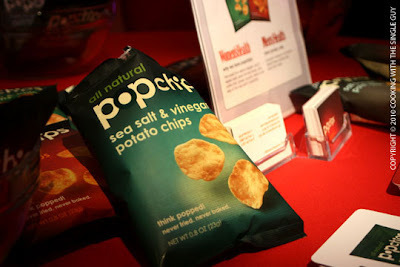 From faux meat to faux potato chips, I visited the San Francisco-based Pop Chips, which I have to say was my favorite tastes of the night. Most of you know I’m not a snacker and I avoid most deep-fried foods, which is why I don’t eat most potato chips or French fries. But I’ve heard about Pop Chips and how they make their crunchy chips without frying or baking them. It’s some air popping technique that makes them crunchy but light. I tried the sour cream and chives because that’s one of my favorite flavors, but I realized that the most addictive flavor is probably the salt and vinegar. I can finally snack on something with no saturated or trans fat. The question is can I stop at one bag? 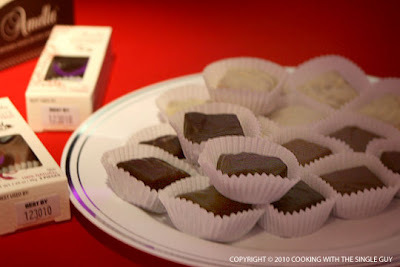 Of course, you can’t have a food event without chocolates. A couple of tables I visited included Eclipse Chocolat from San Diego and met the chocolatier William Gustwiller, who makes and package all the chocolate bars by hand. 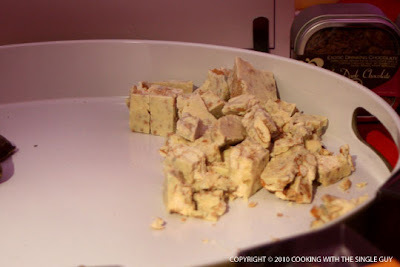 This is his white chocolate bars with bits of pretzels, marshmallow and sea salt. It’s the whole sweet and savory thing going on. One person sticking with the sweet is Amella Caramels from Los Angeles. Problem with trying their caramels (I tried the passion fruit flavor) is that the flavor stays with you because you get bits stuck all over your teeth. My last stop before I headed home was at Scott Sapire’s table. 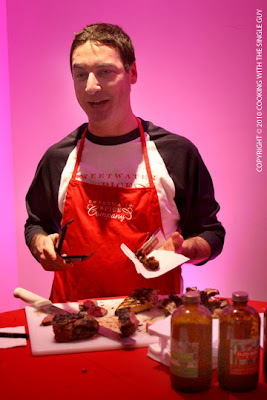 Sapire owns Sweetwater Spice Co. from Austin, Texas, and he was sampling what he calls “BBQ Bath” because he soaks various meats in his special marinades like a brine. 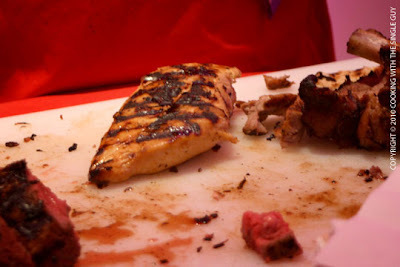 The flavors were subtle, but I was totally captivated by the tenderness of his BBQ that he was sampling. This guy knows how to cook meat. I loved how walking around with my Single Guy tag, people kept trying to convince me that their products would be perfect for singles (like this one company pushing fully cooked brown rice – it’s like they’re reading my mind). You know what I want someone to invent? Pork chop in a bag. Now that’s Single Guy food.